Sophie Gerson, a legendary figure in the history of textile union organizing in the South and a lifelong fighter for peace, justice and socialism, died March 20. She was 96. Like many in her generation, Gerson was inspired by Russia’s socialist revolution, which she witnessed as a child. Sophie Melvin was born Feb. 22, 1910, in a Jewish village in the Ukraine, the second youngest of six children. Among her earliest memories was the arrival of the Red Army in the village. A soldier knocked on the door and invited the family to a meeting in the town square where an end to anti-Semitic pogroms was proclaimed. The soldier carried Sophie to the meeting in his arms. Her older brothers left Ukraine to avoid conscription into the Czar’s army. With her mother Esther and youngest brother Moish (Murray), Sophie came to the United States, settling in Brownsville, Brooklyn. By age 15, Sophie was already going to meetings, marches and rallies. In 1926, at age 16, she traveled to Passaic, N.J., where she helped staff a day camp for the children of 16,000 striking wool workers. There she was exposed to socialists, communists, and militant working-class struggle. Her commitments were formed, and she never wavered. At age 19 in 1929, Sophie, then a member of the Young Communist League, hitchhiked to Gastonia, N.C., to join in support of 2,000 workers on strike at the Loray textile mill. Evicted from company housing, the workers were living in tents outside town. Company gun-thugs attacked one night and during the melee, the police chief was killed. Sixteen strikers and their supporters, including Sophie and two other women, Vera Buch and Amy Schecter, were arrested and charged with murder. A few days later the thugs assassinated the striker leader and songwriter Ella May Wiggins. The National Textile Workers Union and the International Labor Defense mounted a legal defense. The defendants won a change of venue and were later acquitted although the strike was broken. Sophie continued her work with the NTWU, and was arrested twice for “illegal picketing” during a textile strike in Patterson, N.J.
Simon W. Gerson had rushed to Gastonia to join in defense of Sophie, to whom he was engaged to be married, and the other arrestees. He and Sophie were married in 1932. 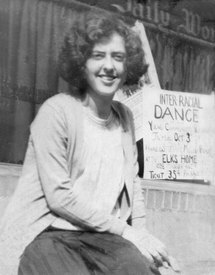 As a relief worker during the Great Depression, Sophie helped mobilize a demonstration of more than 100,000 unemployed in Union Square, March 6, 1930. Mounted police brutally attacked the peaceful marchers but the struggle of the unemployed led to huge victories — unemployment compensation, Social Security, laws upholding workers’ union rights, and a ban on job discrimination based on race and gender. Si Gerson became New York City Hall correspondent for the Daily Worker. Later Manhattan’s liberal Republican Borough President Stanley Isaacs appointed Si to his staff. For the first time, the Gerson family enjoyed a livable income with health benefits. A year later their first child, William, was born. While Si served in the U.S. Army in the Pacific during World War II, Sophie and son Bill lived with Sophie’s brother Moish, his wife Bella and their daughter Beezy. Sophie worked as a nursery school teacher and later as a camp counselor with Bill as a camper. In 1946, daughter Deborah was born. In 1948 the Gersons moved to Bensonhurst, Brooklyn, where Si and Sophie lived the rest of their lives. The democratic voting method called proportional representation had enabled the election of progressive, minority party candidates, including Communists Peter Cacchione and Benjamin Davis, to the New York City Council. Sophie was an active participant in these victories. When Cacchione died in office in 1947, Si was appointed to complete his term. But McCarthyism engulfed the nation. Tammany bosses refused to seat him and organized to eliminate proportional representation. Si Gerson was one of dozens of Communist Party USA leaders indicted under the Smith Act in 1949 and 1950, charged with advocating the overthrow of the government by “force and violence.” The FBI arriving to arrest Si at their Brooklyn home was a bitter memory for the family. Sophie threw herself into the Families Committee of Smith Act Defendants, which organized material and emotional assistance for the defendants and their families. Si was acquitted, but in 1953, in what Si called “a low, vindictive blow at my family,” the federal government attempted to strip Sophie of her citizenship and deport her. In her later years, Sophie was a tireless activist with the National Council of Senior Citizens, fighting for universal health care and defense of Social Security. A woman of charm and passion, she developed ties with a range of local activists, including nuns and other local Catholics. She became known to elected officials leading groups to the State Assembly and relentlessly advocating for social benefits. A joyful grandmother, she loved being with children and said she regretted that she hadn’t had more. Both Si and their son Bill passed away in 2004. Sophie is survived by her daughter Deborah of San Francisco, granddaughters Timi Gerson of Washington, D.C., and Frieda B. Gerson of Paris, France, and many nieces and nephews.